Beautiful teal green color and smoothly tumbled Turquoise stone from Kingman, Arizona, USA. Turquoise is an efficient healer providing solace for the spirit and well-being for the body. Turquoise is a protective stone and has been used as an amulet for centuries, believed to change color to warn of danger or infidelity. 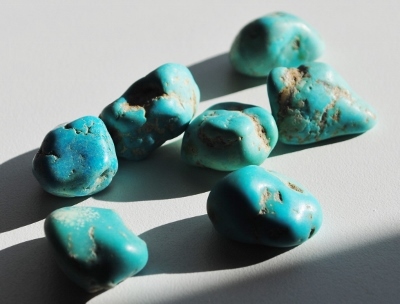 Turquoise promotes spiritual attunement, and enhances communication with the physical and spiritual worlds.Turquoise may be helpful in exploring past lives and showing that the creation of your "fate" is ongoing depending on what you do at each moment. 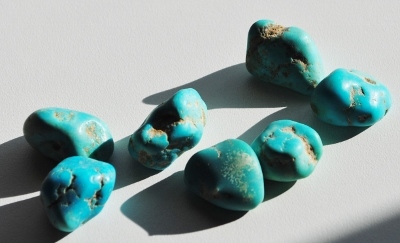 Turquoise is referred to as a purification stone; it dispels negativity, cleans electromagnetic smog, and protects against pollutants from the environment. Turquoise balances and aligns all the chakras with the subtle bodies and attunes the physical level to the spiritual. Turquoise may be helpful to stabilize mood swings, assist in creative problem-solving and calms the nerves when speaking in public.Turquoise is an excellent stone for exhaustion, depression or panic attacks. In healing, Turquoise strengthens the meridians of the body, and the subtle energy fields. Turquoise supports a healthy immune system, regenerates tissues, and supports the assimilation of nutrients. 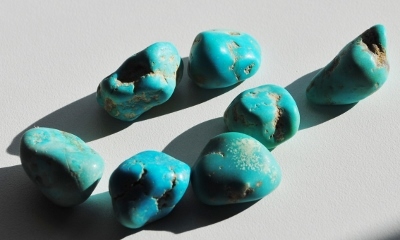 Turquoise may be helpful for treatment of the eyes, including cataracts, the stomach, and alleviates cramps and pain.